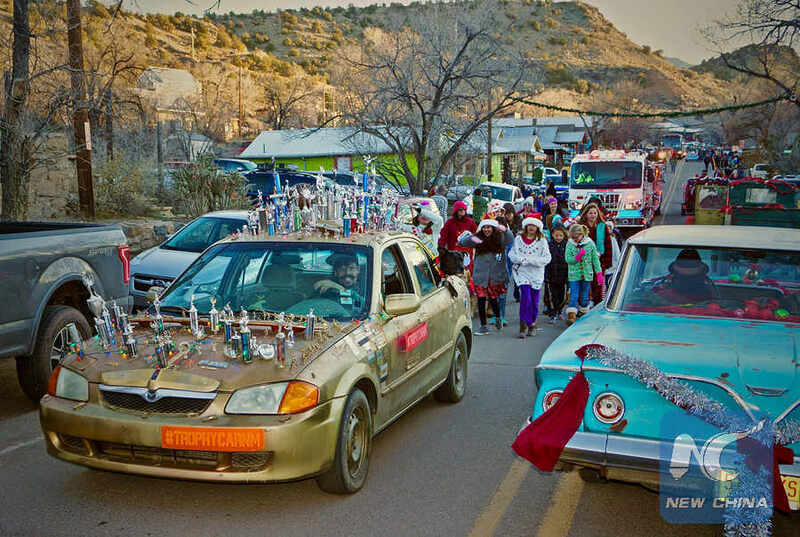 ALBUQUERQUE, the United States, Dec. 8 (Xinhua) -- As short as ten minutes, the half-mile long annual Christmas parade in the former ghost town of Madrid, New Mexico, the United States, gives enough joy and hope to its people. The small town of Madrid holds its Christmas parade in early December; on Dec. 1 this year. 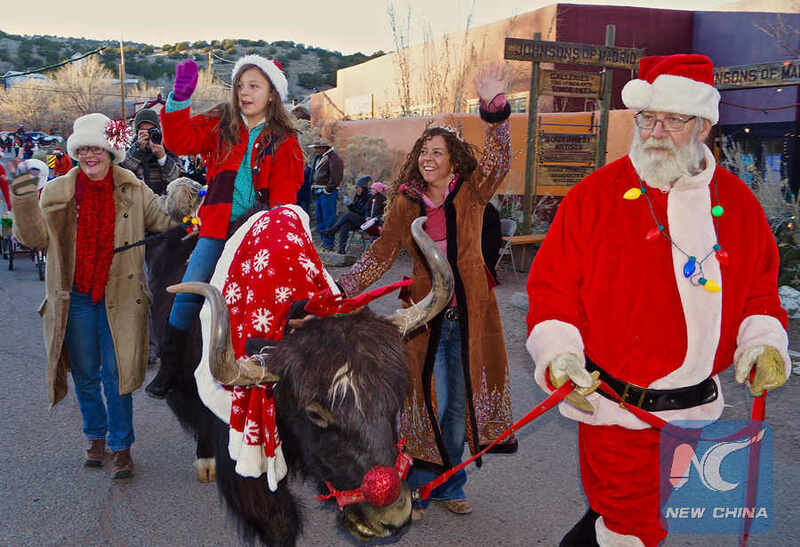 The yearly Christmas parade reflects the eclectic nature of the town and its only handful residents. There are elaborate costumes, vintage cars, and various animals...dogs, cats, horses, mules, and burros...as well the annual arrival of a yak. There is no actual planning of the event. People just show up and join the parade which only lasts about ten minutes due to the size of the town. "We just all get together and make it happen. I think it's because so many people enjoy it now. 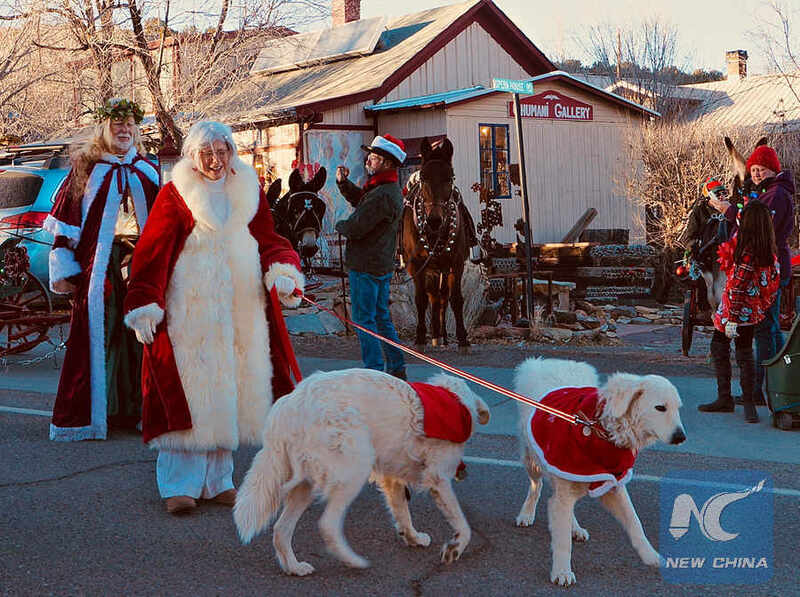 It's kind of an artistic expression mixed with scenes of yesteryear," Melinda Bonewell, co-owner of Madrid's Mineshaft Tavern and the town's informal historian, tells Xinhua. Once a booming company-owned coal mining town in the mid-century, the little town of Madrid became famous for its spectacular Christmas lights display. The huge industrial power plant at the mines and the abundance of coal provide electricity for a massive array of lights, known as Toyland, which is said to be the inspiration for Disneyland after its creator, Walt Disney, visited there. In the 1920s till 1940s, the light display got so popular that it appeared on the media all over the country. "It was famous. I've seen it in the Chicago, New York, California papers. People would come from all over," Bonewell says. Bonewell says, the light show was so spectacular that the Trans World Airlines (TWA) would reroute its flight path so that passengers could see the Christmas lights from above. TWA bankrupted in 2001 and was acquired by American Airlines. From the 1920s through World War II, there were about 3,000 people employed by the mining company. During the war, the mines supplied coal to power the laboratories that developed the first atomic bomb at Los Alamos, New Mexico. After the war, the demand for coal decreased and the mines were shut down, leaving only a handful of people living in what became a ghost town with very little functioning infrastructure. Bonewell remembers well when people left the town. "They laid everybody off, people got in their automobiles and left, and it became a ghost town pretty much overnight. It went from its heyday in the '20s and '30s, of 3,000 people, and there's maybe a dozen from the late 1950s to 1973," Bonewell told Xinhua. In the early 1970s, hippies and artists started moving into the deserted buildings of the old mining community. Today, the town is home to many art galleries and crafts shops. There are mineral deposits of turquoise in the area that is used in much of the jewelry made by local artisans. The town maintains its free-spirited ambience. There is no elected city government, so the local residents run the town as a volunteer community. The "official mayor" is a dog named Mayor Fuzz.